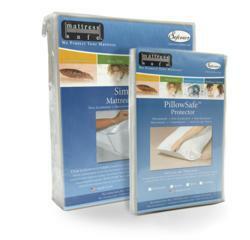 Mattress Safe now offers vacationers an inclusive personal bedding protection kit: The Sofcover® Travel Kit. The Travel Kit features the Sofcover® Simplistic Overlay and two Sofcover® PillowSafe™ Protectors available in various sizes. Mattress Safe's® Sofcover® Simplistic Overlay is great for travel. It can be placed over a hotel mattress or sheet set to provide you with extra peace of mind when sleeping on an unfamiliar mattress. For solo travelers or families, the Sofcover® Simplistic Overlay provides a clean layer of protection for a restful night’s sleep. The Sofcover® PillowSafe™ Protector is used to encase a hotel pillow or one a traveler has brought with them. The PillowSafe™ Protector provides comfort and confidence when sleeping in a new or questionable environment where a traveler’s head may be exposed to germs on a hotel pillow. PillowSafe™ also shields a personal pillow from any germs or bacteria that the pillow would come in contact with in a hotel environment. The Simplistic Overlay and PillowSafe™ Protector fold up compactly for easy transportation in luggage. Both the Simplistic Overlay and PillowSafe™ Protector are made of Mattress Safe’s Sofcover® fabric. The Sofcover® fabric is a luxurious knit fabric that is soft to the touch while conforming to fit any mattress. Made of a comfortable stretch fabric and joined to a unique light weight barrier, the Simplistic Overlay and the PillowSafe™ Protector provide waterproof protection against fluids and stains. The Sofcover® fabric is carefully selected to be designed for comfort and ease of care while providing durability and protection for all applications. Both products can be easily removed and placed directly into the washing machine to be laundered with regular detergent and dried in a drier on the cool setting. When travelers have returned home, the versatile Sofcover® Simplistic Overlay is the perfect addition to home bedding. Adding additional protection, the Sofcover® Simplistic Overlay can be used under sheets to protect to a home mattress for pets, kids, fluids, or stains. The Sofcover® lines’ additional benefits include being made in the USA and being fire retardant. For more information, visit http://www.mattresss.com. Email info(at)mattresssafe(dot)com.